Will you be joining us live for FinovateEurope 2015? Following the action via the Finovate Live Blog and Twitter feed (@Finovate)? However you plan on participating in the first Finovate conference of the year, our Sneak Peek series helps you get to know the presenting companies before they hit the stage next month. We’ve already highlighted 18 out of the more than 70 companies demonstrating their latest technologies. If you missed them, you can get up to speed with Parts 1, 2 and 3 of our Sneak Peek series below. Today we bring you another set of six presenters: Bendigo and Adelaide Bank, CPB SOFTWARE, Ixaris, JSC Delta Bank, QCR, and Topicus.Finance. Bendigo and Adelaide Bank have a long, 156-year history of innovation. Our latest innovation is redy, a mobile commerce platform. redy is a fast and secure mobile commerce platform that improves the shopping experience and connects shoppers, businesses, and communities for a common cause. Musgrove played a pivotal role in the expansion of Community Bank. He is always on the lookout for ways to give back to his community. vanEmmerik has been with Bendigo and Adelaide Group for 7 years. He has been part of the redy team since its inception. CPB SOFTWARE offers profound expertise, creativity, flexibility, and high quality financial software solutions including premium ASP and BPO services. PROFOS – The Bank is where Clients are! Thomayer is founding member and since 2000 CEO of CPB Software. Areas of responsibility: strategy, human resources, marketing, and sales. Held different leading positions in some banks before. Aigner is founder and CEO of emotion banking, a consultant company for banks and founder of victor, the main analysis and championship for banks in the German-speaking area. Nekham is founder and CEO of networx business services. He is lecturer at the Vienna University of Economics and Business, and a negotiation and communication consultant and coach. Ixaris is a fintech company specializing in the delivery of next generation card programs. Abela has 15 years experience specializing in leveraging technology to deliver innovative and competitive payment products and solutions. Scerri has over 10 years’ experience in technology products, with special focus on design and delivery of solutions for the payments industry. JSC Data Bank is a Ukranian innovative universal bank that provides a wide range of products and services for all types of clients. Pay2You is a service that makes your communication channels available for transferring money. QCR has developed RiskAware, an innovative credit risk assessment technology which can add major value to existing risk management practices at financial institutions. Through faster and more accurate credit risk management, RiskAware can save millions of USD a year in credit losses for financial institutions. Varkonyi’s professional career in credit risk management spans 12 years. Before founding QCR, he managed a credit portfolio at CIT Group and underwrote loans at Barclays. Kocso is a seasoned technologist with 10 years of experience developing financial software applications at Morgan Stanley and Leonteq Securities, Switzerland. Topicus.Finance is a flexible, process-oriented business lending platform with self-service capabilities. “Customer centric” is no longer a hollow phrase. FORCE Business Lending enables your employees to fully focus on (the business of) your customer. 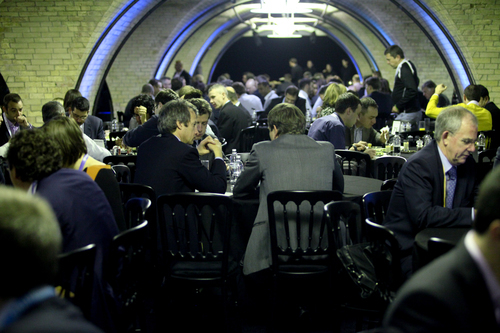 FinovateEurope 2015 will be held February 10 and 11 in London. Pick up your tickets today and join us for the first Finovate conference of the year.